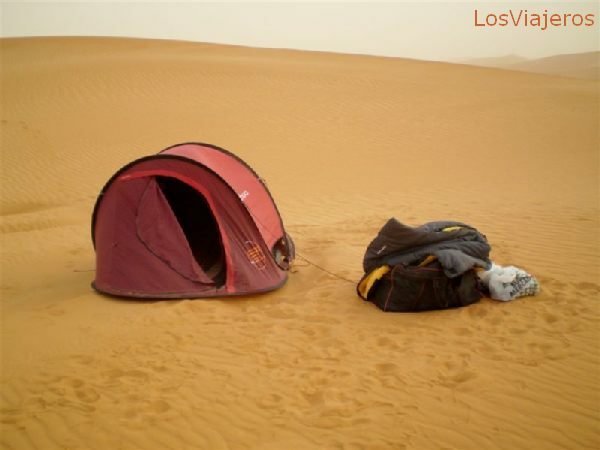 Our camping tent, now after sunrise, and with the sand storm very weak. - Libya: Just after dinner, while we were admiring the starry night. One dust storm come, hide the moon, and force us to hide on our camping tents. The bags outside and tied to the tents, were for anchoring, and avoiding the wind to take us. Nuestro coche encallado en el borde de una duna Our car trapped in the sand at a dune´s edge "Index"